Peter Thiel AMA: A question session with the billionaire PayPal founder. Peter Thiel getting ready for his AMA. 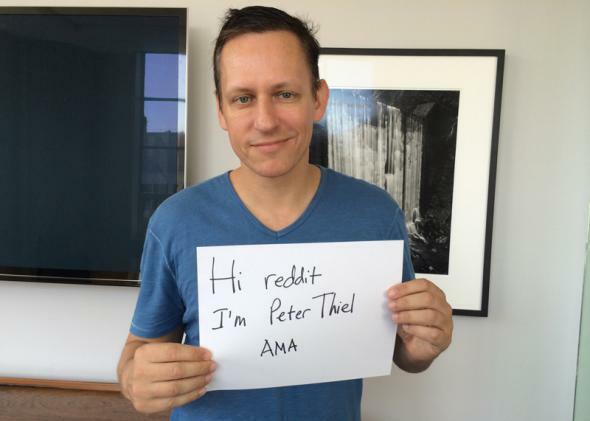 Peter Thiel, billionaire founder of PayPal, naysayer of the American college system, and famously outspoken libertarian, took to Reddit on Thursday for an “Ask Me Anything,” or AMA, session. For about one hour, Thiel answered questions from the Internet on everything from Silicon Valley fashion to the National Security Agency and Edward Snowden. You can learn a lot from reading his responses—perhaps most importantly, that Thiel has a sense of humor. No absolute and timeless sartorial rules. But, in Silicon Valley, wearing a suit in a pitch meeting makes you look like someone who is bad at sales and worse at tech. If technology involves doing more with less, than US health care (like US education) is the core of “anti-technology” in this country: For the last four decades, we have been spending more and more for the same (or even for less). Not optimal if you break the law to the point where the company gets shut down (think Napster). I’m not saying that will happen to Uber, but I think they’ve pushed the line really far. PayPal built a payment system but failed in its goal in creating a “new world currency” (our slogan from back in 2000). Bitcoin seems to have created a new currency (at least on the level of speculation), but the payment system is badly lacking. No, the CIA is a front for Palantir. Read the full AMA on Reddit.